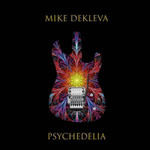 Share the post "EP review: MIKE DEKLEVA – Psychedelia"
There are many guitar hero wannabees out there but frequently they fall down due to lack of production values, guitar tone, or craftsmanship. Mike Dekleva has all these qualities in spades. Mike who? Well to be honest he’s no spring chicken but evidentally commands respect from fellow musos and this is his second EP. The title track is a funky and easily accessible workout whilst ‘Miguel’s Last Stand’ is urgent, highly melodic, and impressive. ‘Between The Devil And Deep Blue Sea’ and ‘Love Finds A Way’ are less frenetic but afford great examples of Dekleva’s consummate good taste. There’s great support here from Jason Webb (keys) and the rhythm section of Robbie Calvo, Amanda McCoy, and Grady Saxman. This entry was posted in All Posts, Single and EP reviews and tagged EP, guitar, instrumental, Mike Dekleva, psychedelia, review. Bookmark the permalink.